John Devereux teaches and researches the law of torts at the Law School. He has a special interest in medical law, most notably in the areas of competency to consent to medical treatment and in epilepsy and the law. A Rhodes Scholar, John has worked as a lawyer in a variety of contexts including as a Barrister, as a consultant to a multi-national law firm, a Law Reform Commissioner for Queensland, a legal member of the Social Security Appeals Tribunal and as a Defence Force Magistrate. John was formerly Lecturer in Law at Keble College, Oxford University and Assistant Dean of Magdalen College, Oxford University. He is a former Associate Vice Chancellor of A.C.U. 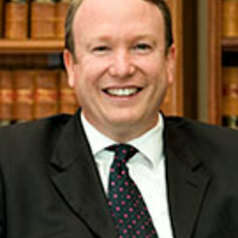 John is an Honorary Fellow of the Australasian College of Legal Medicine. He is the legal member of the Queensland Health Quality and Complaints Commission. As a member of the Australian Defence Force John has served in the infantry corps and the legal category. He has seen active service in Iraq and Afghanistan. John has been awarded a Bronze Star by the United States of America.